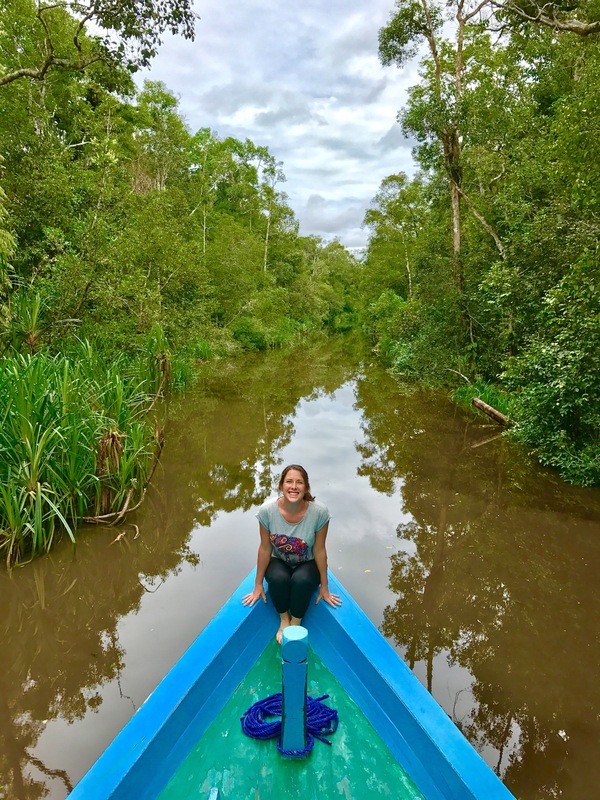 As I sat on the bow of our klotok boat slowly gliding through the Sekonyer River in Borneo, I saw movement in the trees to my left, about 100 yards ahead. I watched as one thing after another flung themselves into the murky water from high up in the trees above. I signaled our captain and he slowed the boat as we came upon the unknown animals. As we drew closer, I saw a group of the most unusual monkeys, and maybe animals, I have ever seen. 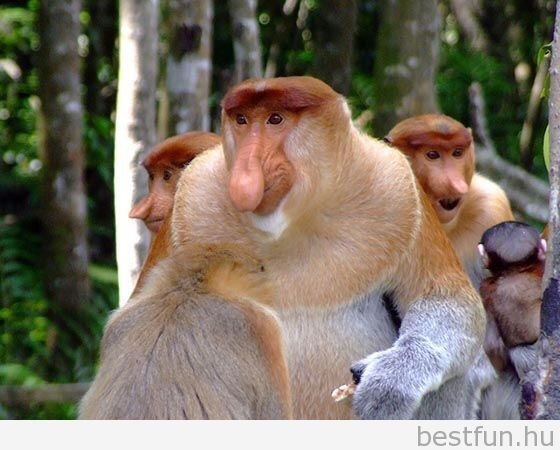 These monkeys had huge bulb like noses, or pointy noses sticking straight out. I called to Jeromy and the boys and we all watched as this band of monkeys swam across the river, climbed up the trees onto the other side, then disappeared into the jungle. 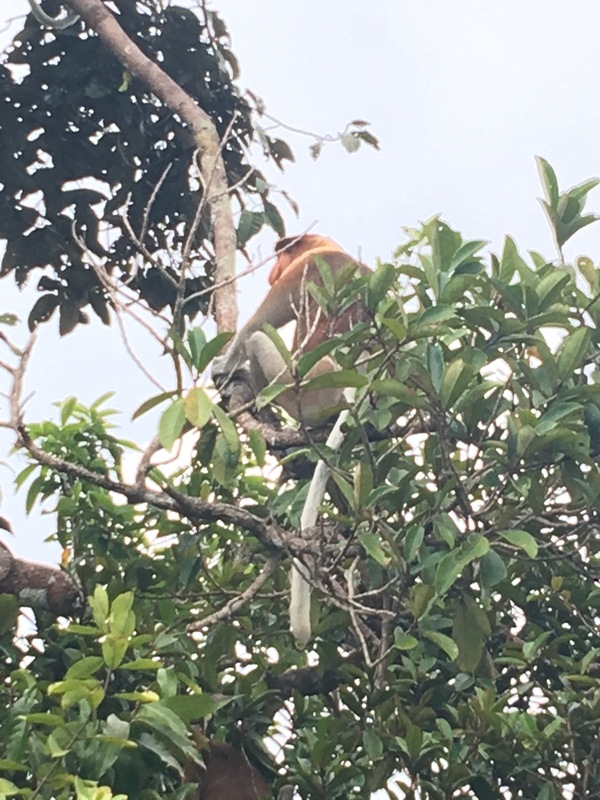 What was this unusual group of monkeys we came across? It was a large group of primates called the Probiscus monkey. This is the best picture I was able to get. The pictures below I pulled from the internet so you could see how truly crazy these monkeys look! The Probiscus monkey is native to Borneo and can only be found on that Indonesian island. 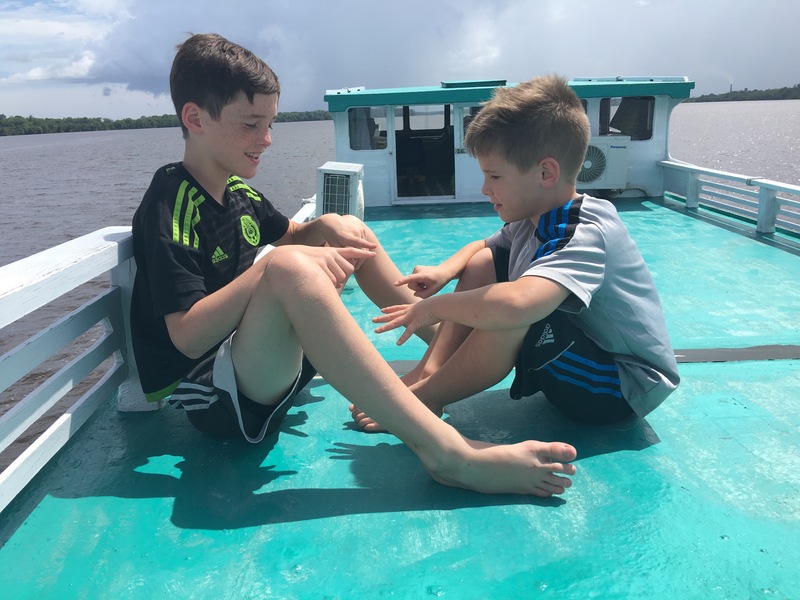 While they look like something straight out of a cartoon, they are very real and we had the chance to see two different harems of them as we traveled through the waterways and rivers of Borneo. 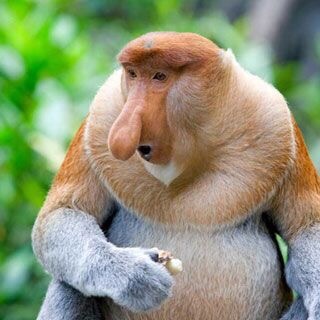 It may be hard to believe, but those giant noses on the male Probiscus monkeys are used to attract mates! We also found out that although they are one of Asia’s largest species of monkey, it is not that unusual for them to be swimming. They have evolved partially webbed hands and feet, which help them swim fast enough to avoid hungry crocodiles, one of their main predators. 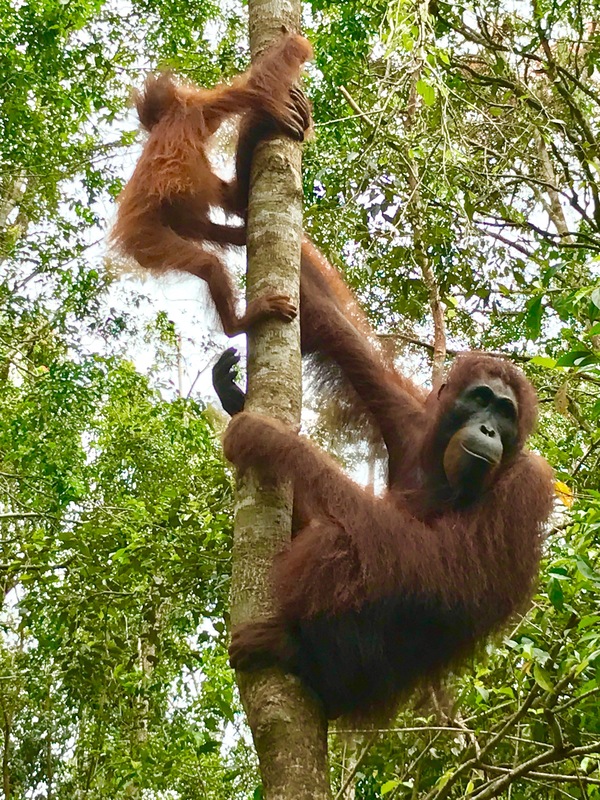 As exciting as it was to see the Probiscus monkeys, we came to Borneo to see the Great Ape they are able to live peacefully alongside on the island of Borneo, and that is of course, the Orangutan. 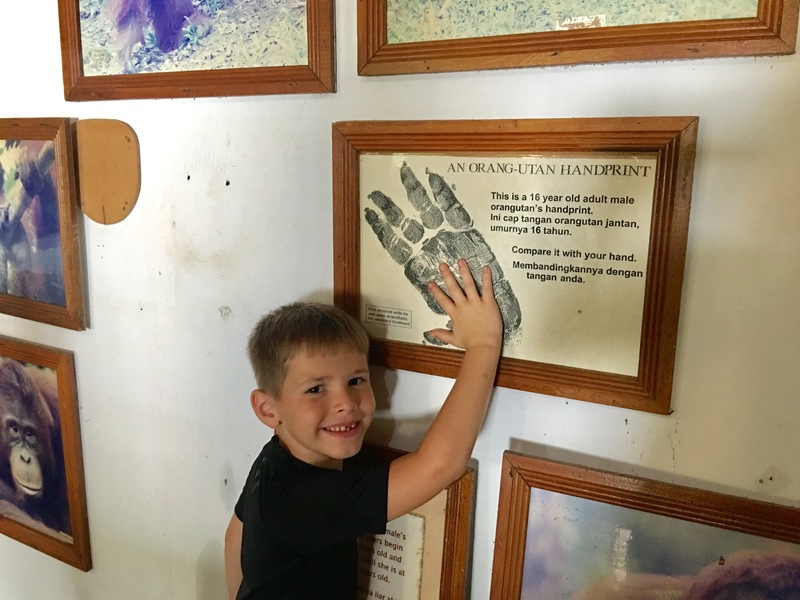 The name Orangutan comes from the Malay word meaning “person of the forest.” You can see where this name comes from because male orangutans are about 5 feet tall with an arm span of up to 7 feet. While he looks very fierce in this picture, I actually just caught him mid yawn. Orangutans have 7 times the strength of a human. Orangutans are the largest tree dwelling animals on earth. Mothers carry their offspring for the first 5 years and suckle them for up to 6 or 7 years. Mothers have offspring on average only every 8 years. Unlike other apes Orangutans are semi-solitary, the largest males spending over 90% of their time alone. 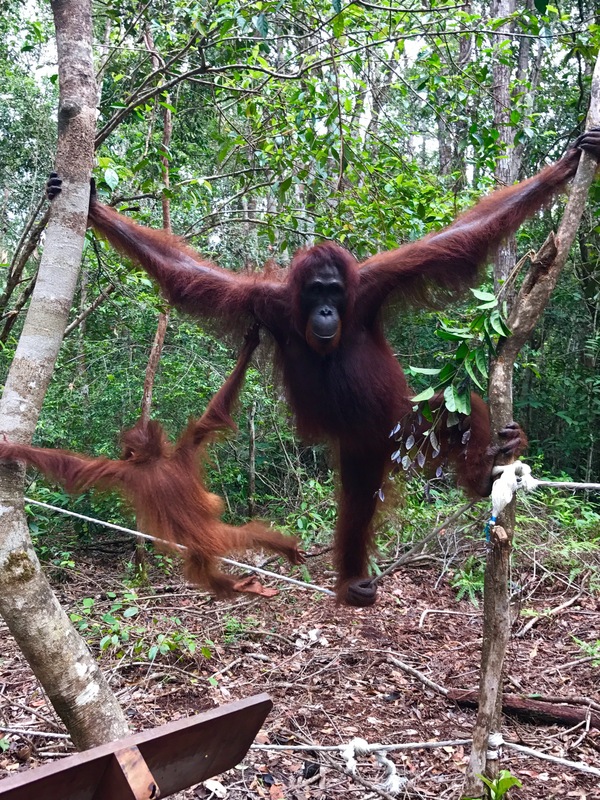 Orangutans make a new bed from leaves and branches in the trees every night, using a very impressive form of weaving and varying materials for structure and comfort. We started on our quest for the Orangutans by flying from Jakarta to Pangkalan Bun airport in Borneo. 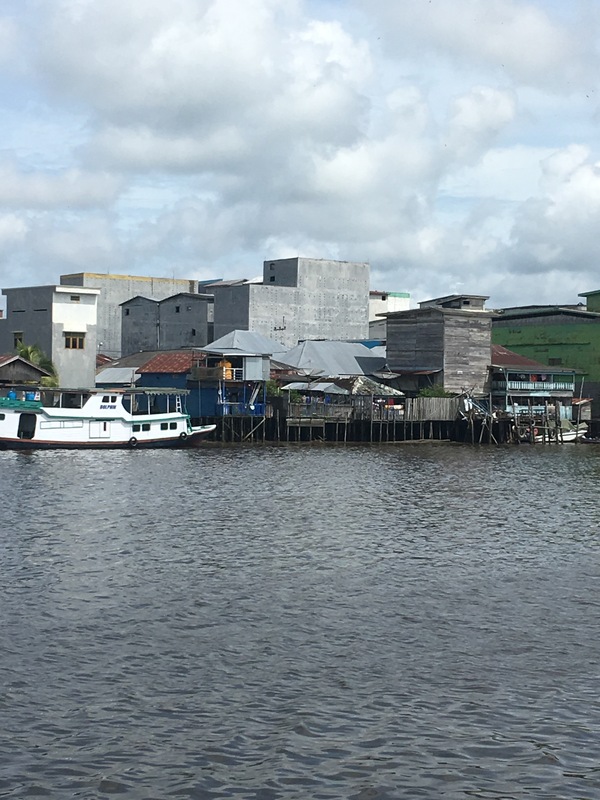 We were picked up by our guide, Sony, and driven to the small town of Kumai where we were to board our boat. Along the way, we saw many tall cement buildings full of hundreds of little holes. They were actually pretty ugly and while the area wasn’t exactly nice, it did have a certain rural charm that was broken up by the tall unsightly buildings. When we asked what these were, Sony informed us that the Chinese have a delicacy they eat called Bird’s Nest Soup. It is said to help with a multitude of medical issues, though it has not exactly been proven. Due to the demand for Bird’s Nest Soup, Chinese people come to Borneo, build these tall ugly buildings, and birds build their nests in the holes. They then collect the nests and export them to China where they are sold at a nice profit. Not a dish I would like to try, but it was interesting to learn about. 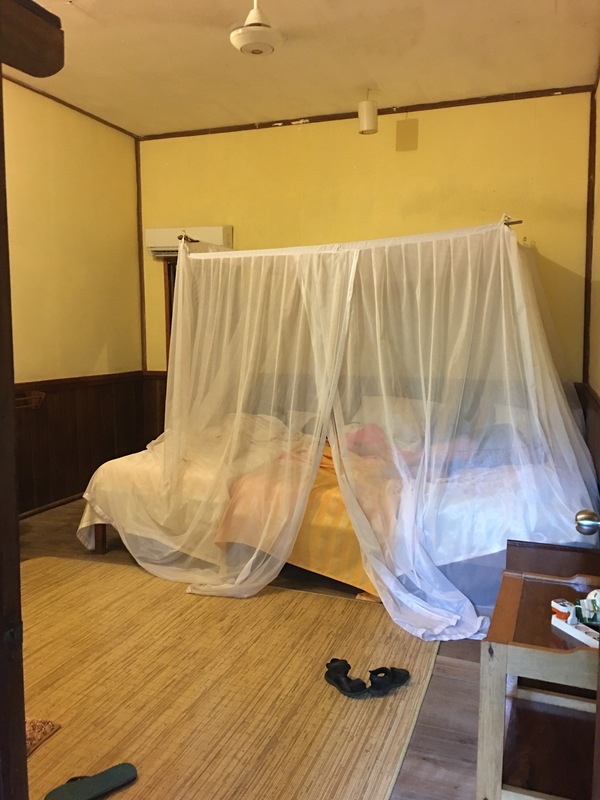 After reaching Kumai, we walked through a one room store, through the one room home attached behind it, across two other boats and then finally onto our Klotok Boat which was docked next to it. 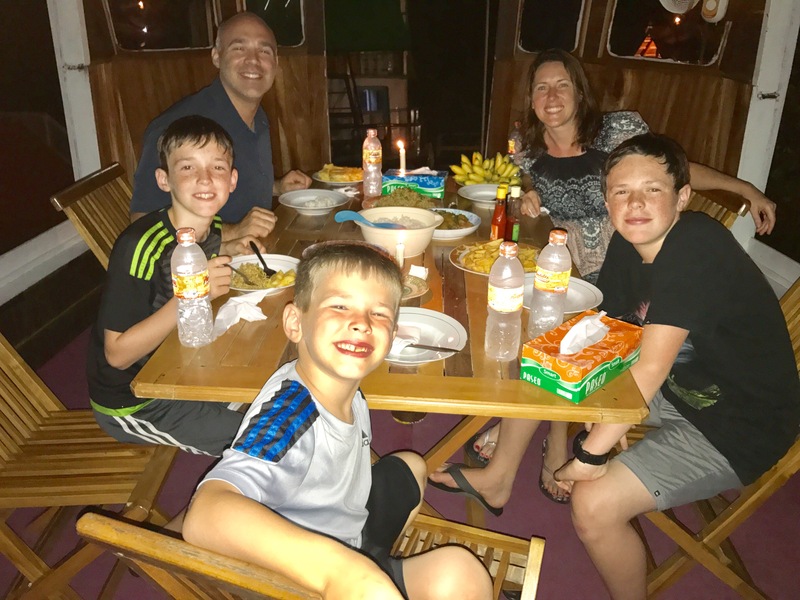 It was just our family traveling on the boat for the three days along with the crew (a captain, our guide, a cook, and two helpers). We are so grateful to these amazing people who helped make our journey a comfortable, safe and memorable one! 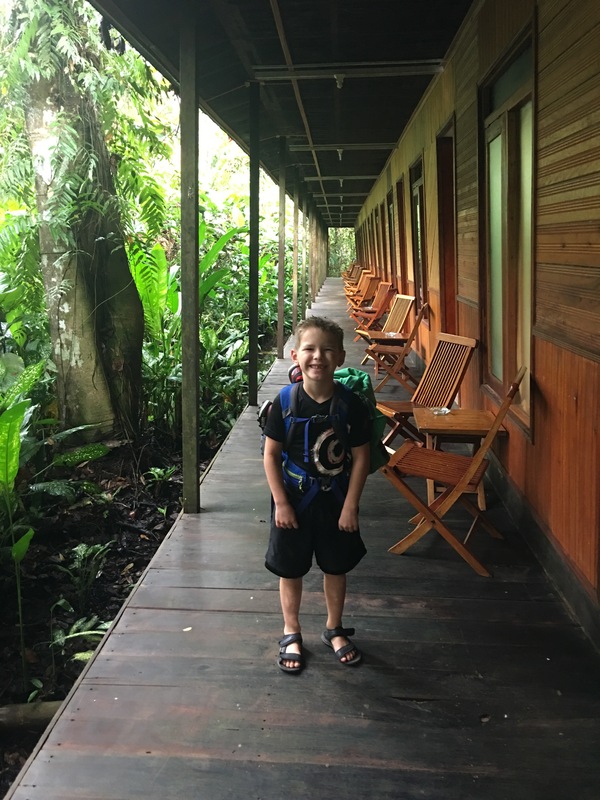 The boys standing in front of, and on, our home for three days in the jungle! Playing chopsticks. Luke can beat anyone in the family! Reading on our phones. We love the Overdrive app that allows free downloads of almost any book through our local library. Parker was reading the Harry Potter series at this point in our trip. Weaving the headbands Tyler learned to make while we were in Thailand. Learning some of the local crafts from our guide. 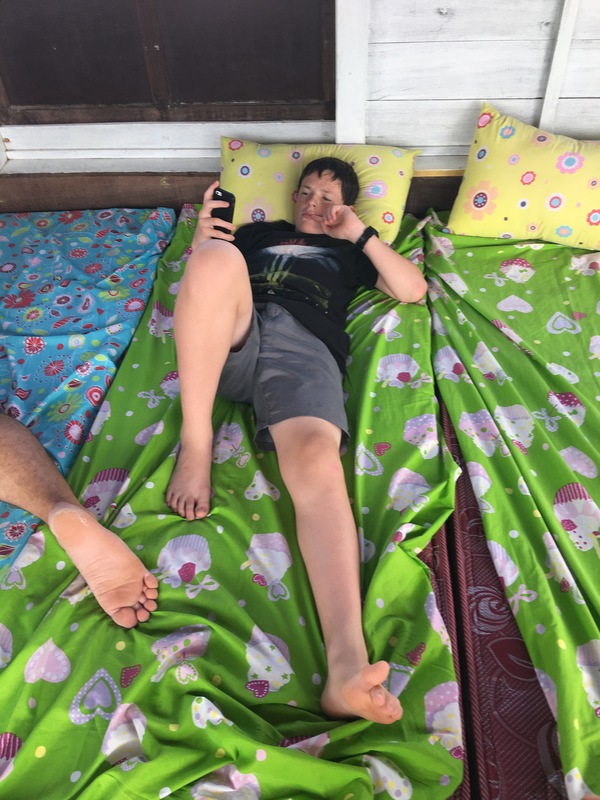 Taking naps and getting foot massages from Luke. He has agreed to not charge us since we are family. Having lovely meals looking out at the scenery as we slowly drifted by. The next morning we got up early, excited to finally have the opport to go see the Orangutans! We continued on our boat another couple of hours up the river and stopped at the first feeding station. 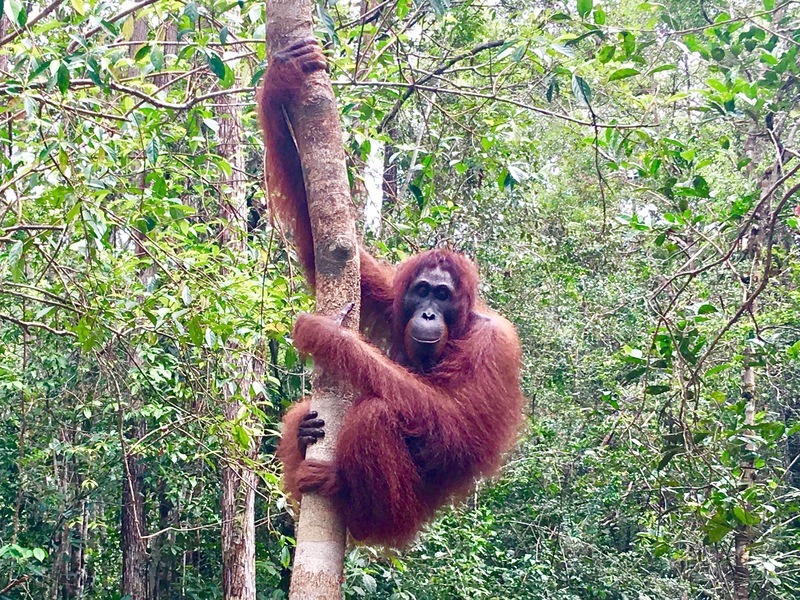 While the Orangutans are living in the wild, some of them have been reintroduced into the wild so they still feed them a portion of their food. There was a trail to the station, but due to recent rains, the trail had been flooded. 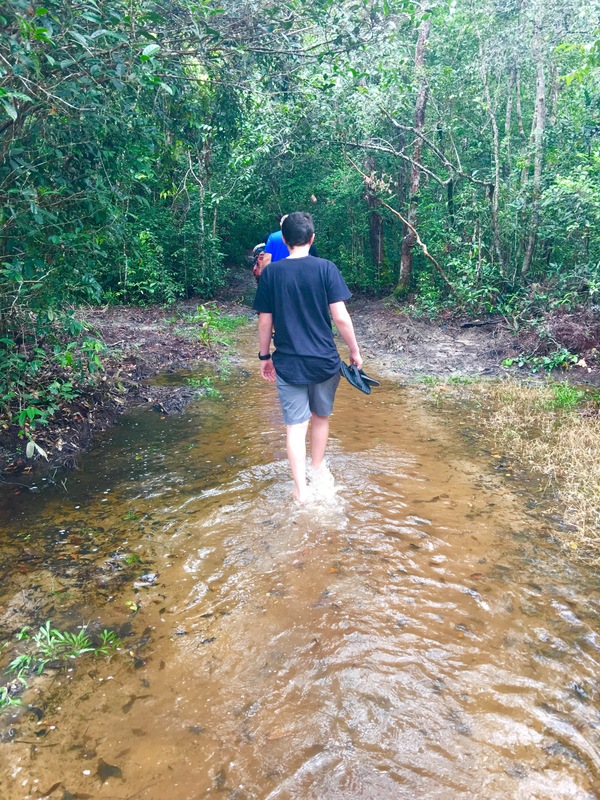 We had to take off our shoes and trek through the water to get there! 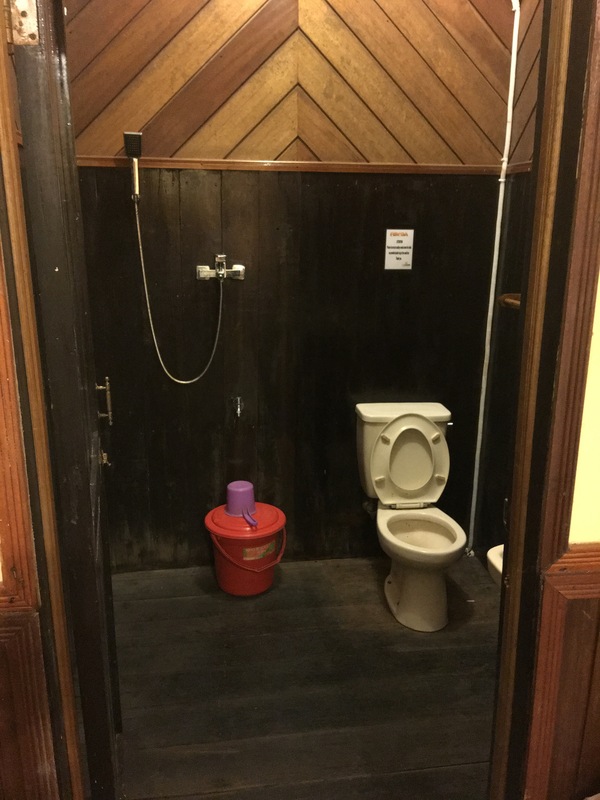 We were just hoping there weren’t any leeches or other unknown Indonesian organisms that were in there to bite us! 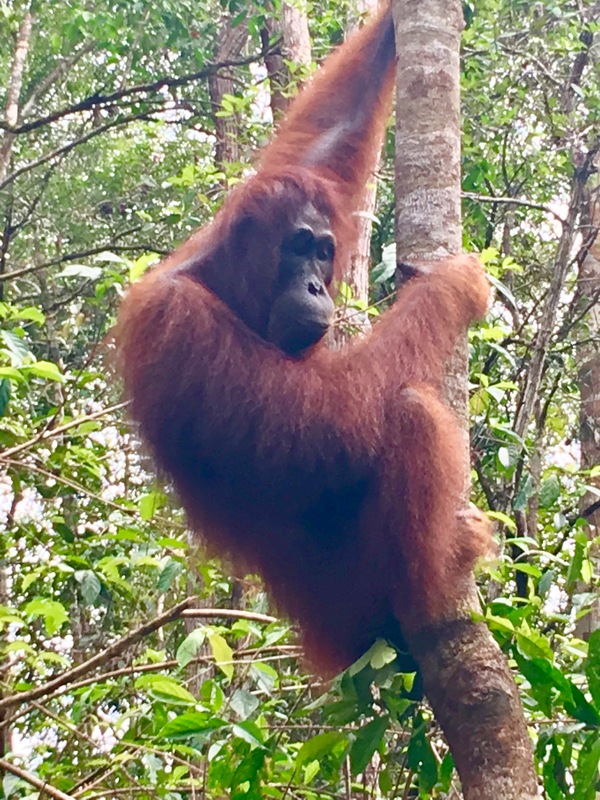 We didn’t see many Orangutans because the feeding happened earlier than usual at the station so we hiked through the jungle and were able to see some swinging through the trees after their morning snack. 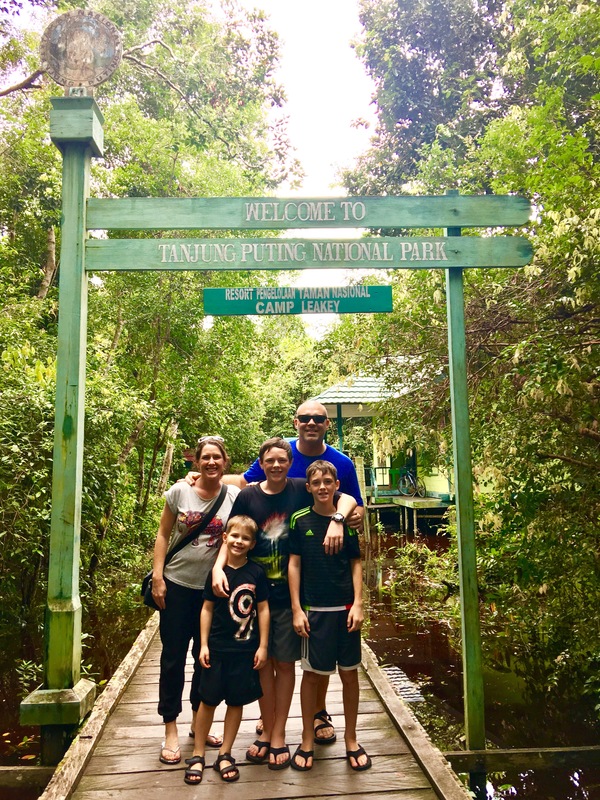 At this point we were a little disappointed we didn’t get a better sighting, but still enjoyed trekking through the jungle and learning about the plants and other animals living there. This plant “eats” the ants for it’s food! At the ranger station, the beginning of our flooded trail. Headed back to the boat. We had to be very careful where we stepped, these wooden pathways were definitely not up to any kind of code! 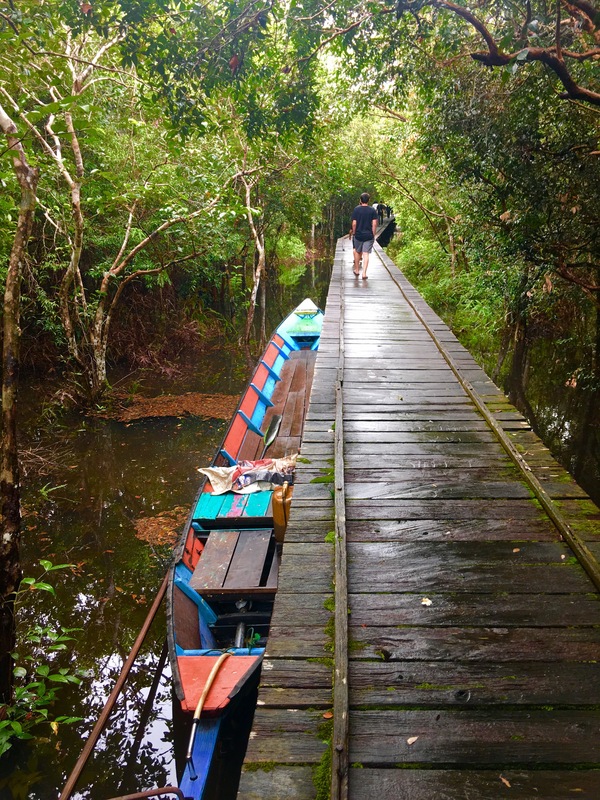 We then headed back to the boat to travel further upriver to Camp Leakey, a former rehabilitation center for Orangutans. 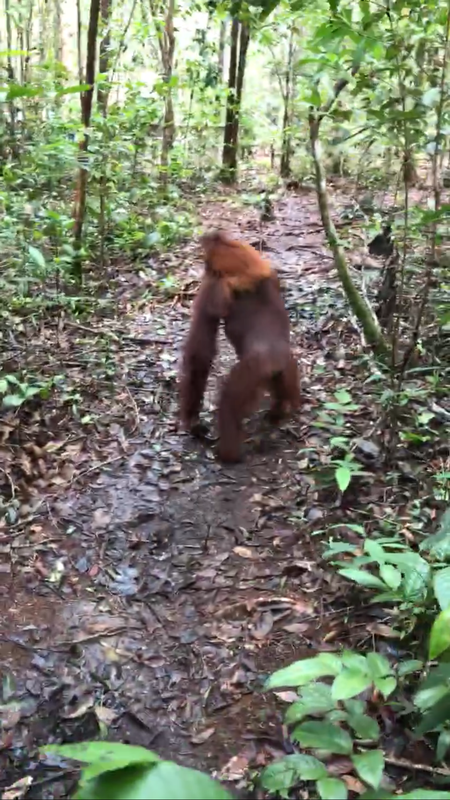 It was in this area where we were able to have some amazing encounters with the Orangutans. They had a visitors center we were able to visit and learn about the earlier conservation efforts that had been made there. 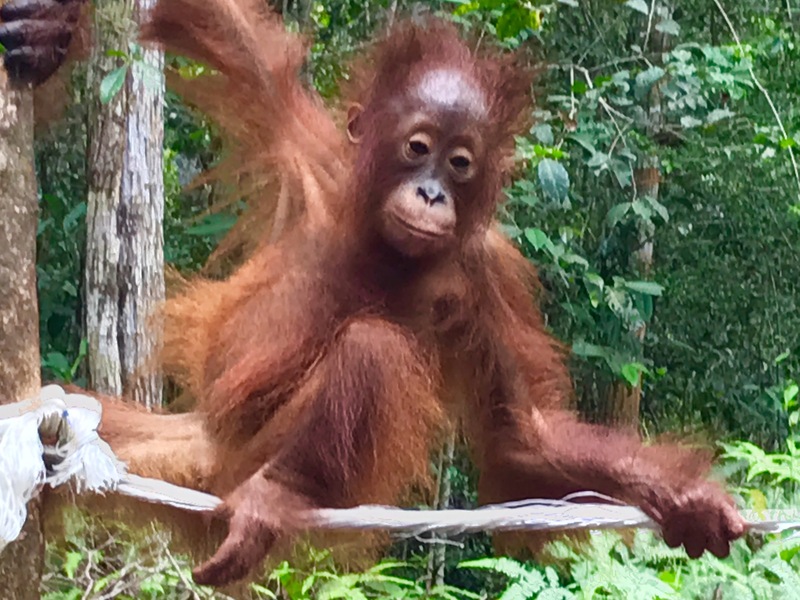 There are still scientists who lived on site and study the behavior of the orangutans. The highlight was a feeding station that was a short 15 minute hike from there. 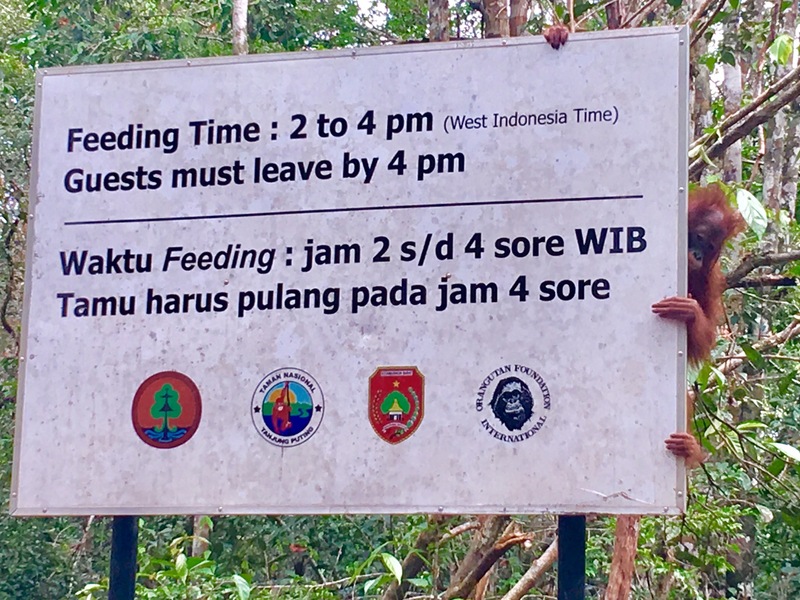 It was amazing as we sat there for 2 hours watching as at least 20 different orangutans of all sizes came to grab a snack and watch all the crazy people taking pictures of them. My favorite part was a curious baby who came right up to the edge of where we were sitting and seemed to be showing off his climbing and swinging abilities. His mom stayed nearby observing in a bored yet attentive way, catching him more than once when a branch didn’t quite hold him, or he misjudged a distance. 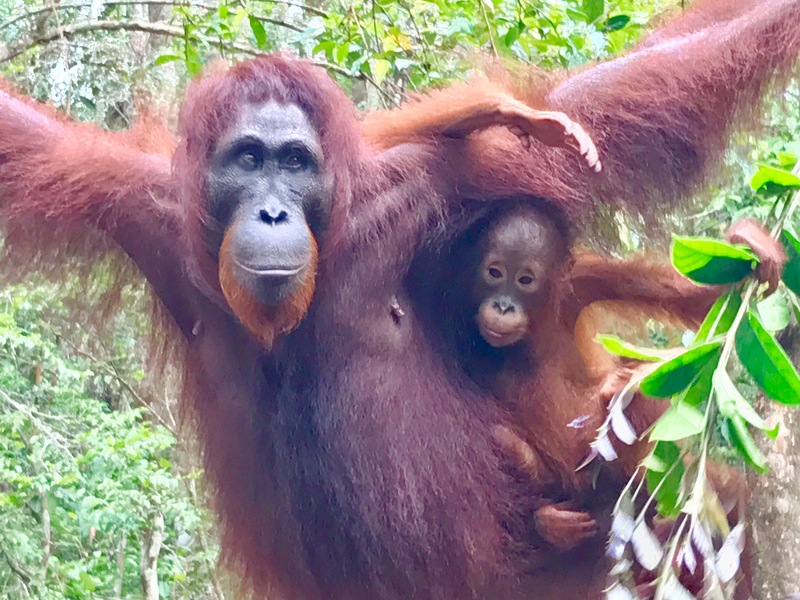 The scariest, and most exciting thing to happen, was when we were hiking through the jungle and suddenly, along the path from the other direction, walked a female Orangutan with a baby clutching tightly to her. Our training from our guide kicked in and we all successfully moved to the side, avoided eye contact, and quietly watched her swagger past us. She knew exactly who was in charge and it wasn’t us! 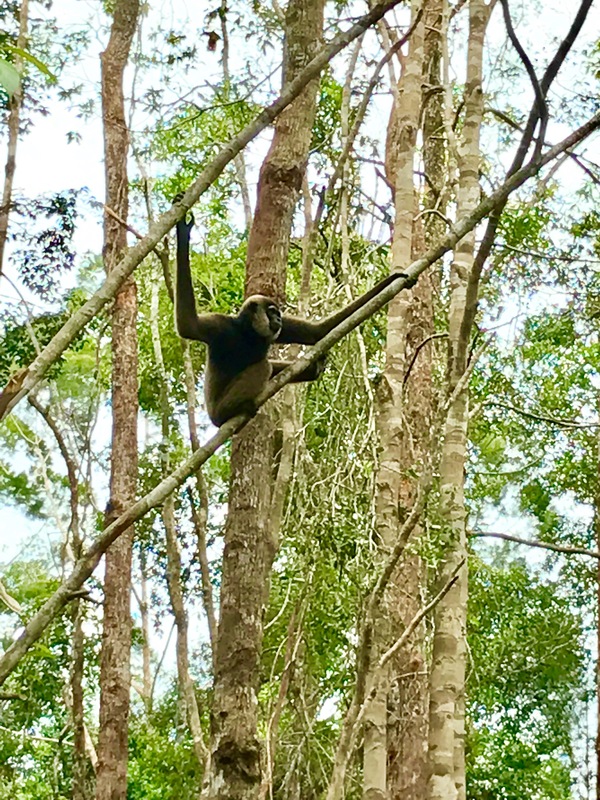 While the Orangutans were the stars of the show, in our hiking and boat riding we were also able to see many Macaques and even a Black Handed Gibbon as well. 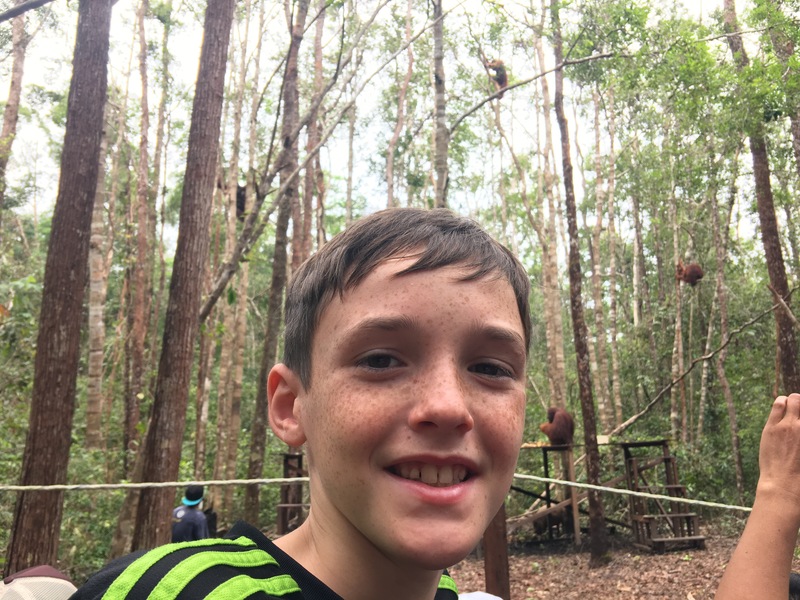 Luke checking out this Macaque. We were able to see lots of these little guys on our walks through the forest and sitting in the trees on the side of the river from our boat. 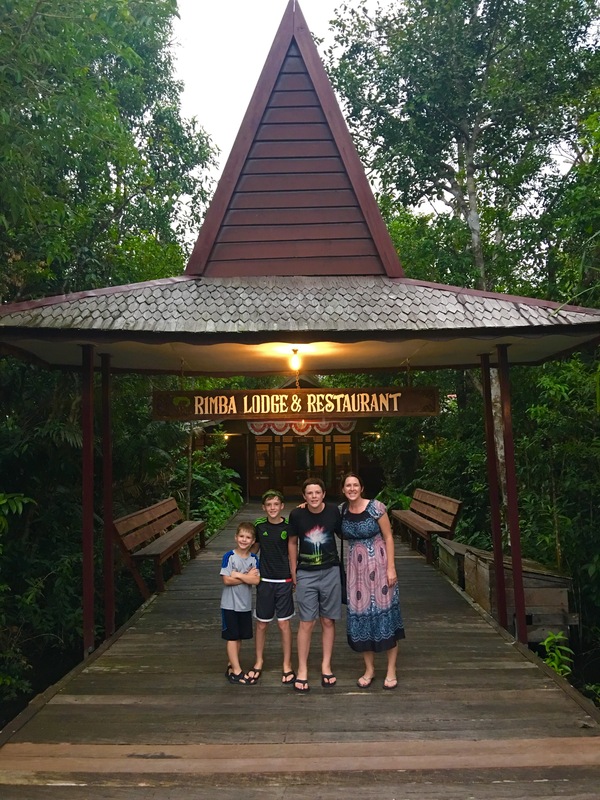 After that viewing we headed back to our boat for dinner, another night at the lodge, and a mystical trip back through the jungles of Borneo to civilization. I am so grateful for this opportunity to be so up close and personal to all of these magnificent creations. 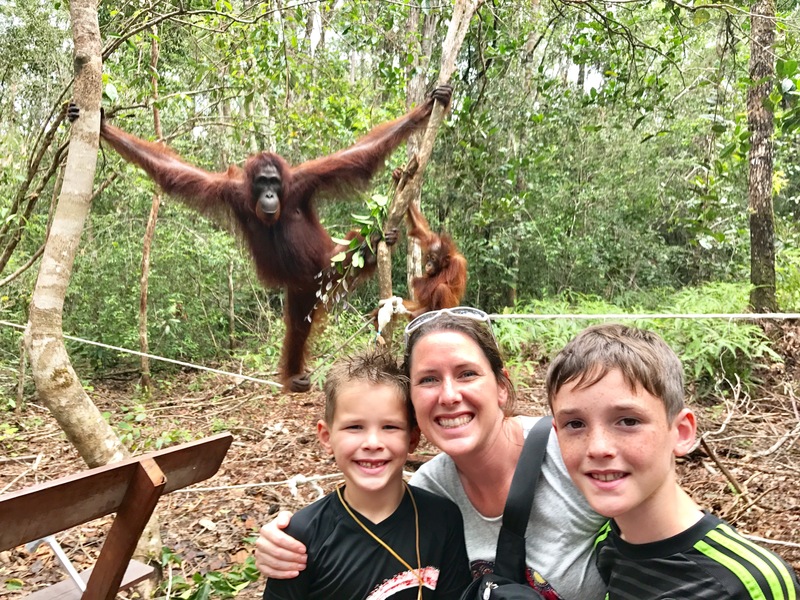 Not just the Orangutans, but also all of the wildlife, flora, and fauna we saw a long the way. It was truly an extraordinary experience we will never forget.